Busy, busy week. I had no time to review Mexico's International games against Poland (1-1) and Chile (1-0 to Mexico). In my opinion the Senior National Team could use some adjustments, the team does not look compact enough, struggling to keep possession and to attack. But at least they didn't lose, unlike the U-22 NT which faced Chile's U-25 NT twice, losing one game 3-1 and only managing a 2-2 draw on the other one. This is worrisome on so many levels, but the most important one I think: This is the team that will represent Mexico on the upcoming Pan American Games and the one that will potentially go to London. And no, it is simply not good enough. I hope Tena (U-22 coach) gets this team working soon. This match will attract a lot of attention because the last time these two teams met (last tournament's semifinals), two Cruz Azul players (Giménez and Corona) got a 6 match ban after hitting a Morelia fan and an assistant to Morelia's coach. So naturally, many people are expecting some sort of confrontation. For the sake of the game I hope nothing of the sort happens. Giménez returned to the starting eleven on the last match (against Pumas). However, it looks like Corona will have to work harder to return to the first team. He should be first choice goalkeeper over Yosgart Gutiérrez but Yosgart has performed well on these 6 matches and, in my opinion, he doesn't deserve to be dropped just because Corona can play now. What will Cruz Azul coach Enrique Meza decide? Stats: Cruz Azul has won 19 out of 37 matches played against Morelia at home (drawing 8 and losing 10). Santos faces top-of-the-table Chivas this weekend and they do so under an interim coach (Diego Cocca got the sack after Santos' defeat against Jaguares last weekend). To climb up on the table, specifically to get into the Top 8, Liguilla spots, Santos needs to win this game and their pending match against Morelia (the one that got suspended because of the shooting near the stadium). In the Mexican League, usually the team that has a new coach doesn't lose, will this hold true for Santos? If Chivas loses points, they risk losing the top spot to Cruz Azul. This will be a very close game. Querétaro is on the relegation spots on the table, they desperately need these three points. The stats show that they have the advantage, winning 5, drawing 3 and losing only one game against Pumas. Will this trend continue? Meanwhile, Pumas is on a bad streak: They haven't won any of their last 4 matches, losing the last two. They will face Querétaro without key players due to injuries or suspensions, and they also have the Concacaf Champions League on their mind (Pumas will play Toronto FC next Tuesday, September 14th). The Player Strike only lasts one week, International football is done, and the kickoff of Serie A has finally arrived. The only fixture on Saturday will be between Cesena and Champions League Participant SSC Napoli. Earlier this week, Napoli striker Edinson Cavani told reporters that he expects Napoli to win Serie A this year. Napoli have made the moves that make them in a position of being serious contenders for the Scudetto. By acquiring players such as Gokhan Inler and Goran Pandev and also being able to keep key players such as Lavezzi and Marek Hamsik, Napoli has a very strong squad capable of rising to the top of Italian football. If Cavani wants to fulfill his prediction of Napoli winning Serie A, they must win tough away games such as this one against Cesena. Cesena, who were promoted to Serie A last year, were able to avoid relegation and added more quality in attack with the addition of Adrian Mutu. Cesena now that entering this game, Napoli are favorites to come out top in this fixture. high paced, thrilling encounter with Napoli coming out on top. With key players jumping ship from Udinese, Inler happened to be one of them. 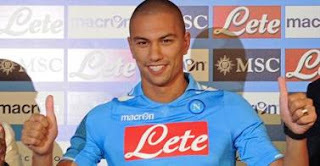 Inler might be the key factor of Napoli's hopes of winning silverware this year. With Napoli's use of an attack-minded formation, Inler provides that very important holding midfielder role that Napoli desperately needs in order to succeed. Watch out for Inler dominating the midfield battles and allowing players like Hamsik, Lavezzi, and Cavani to focus more on the attack. Dortmund will host Hertha Berlin this weekend on the eve before their highly anticipated Champions League fixture against Arsenal. Jürgen Klopp's side might have a difficult challenge this weekend against Berlin as their star player, Mario Götze, will not be able to play because of a red card he received in their previous match against Leverkusen resulting in a three-match suspension. After drawing with Leverkusen, Dortmund cannot afford to drop many points based on the performances of Bayern Munich. Dortmund will have to face a tough test in Berlin who were able to grab a point in each of their away fixtures this season. Jürgen Klopp may decide to rest his star players for the Arsenal game, which would be very risky in my opinion. They are already without Götze and Lucas Barrios, which makes me question Klopp's resting of players because of their lack of depth. So I expect Klopp to field a strong squad for this important fixture. Team News: Götze will miss the game due to suspension, Barrios is still weeks away from returning to first-team action, and Kehl is also suspended for a couple of games. With the absence of suspended Mario Götze, he will be replaced in the lineup by 25 year old Jakub Blaszczykowski. A lot of pressure will be put on Kuba as he has to fill in the creative hole left by Götze. Expect Kagawa to share the creative role with Kuba. Prediction: Draw. I expect this to be a heavily contested fixture. I expect Dortmund to struggle without the services of Mario Götze. I also think the Dortmund players heads will be somewhere else as their game with Arsenal is on the horizon. I expect Hertha Berlin to score first, only to concede late to the home side resulting in a draw. It’s the fourth week to the new campaign and the Arsenal fans tagged this fixture “THE SEASON BEGINS NOW”, after a miserable month of speculations in the transfer window, with the gunners losing three key players in the summer which led to poor performances and an 8-2 humiliation at Old Trafford, find themselves 17th in the league. They can now look forward and forget the early misfortunes in the game against Swansea City at the Emirates. ARSENAL FC: Arsenal has been awful to this point in the season. This Saturday, however, they have an opportunity to bounce themselves into the win column. The Gunners return to Emirates Stadium following an 8-2 thrashing at the hands of Manchester United in Old Trafford Stadium. The Premier League schedule hasn't been very kind to the Gunners, two defeats and a draw saw in 3 games, injuries and suspensions rocking the team week in week out. The big blow going into this match is the likes of Thomas Vermaelen and Jack Wilshere joining the treatment table with long time injuries. As well as summer signing Gervinho and Cameroonian midfielder Alex Song, who both still have this match to sit out to complete their three match ban. The teams are winless so far in the 2011-2012 English Premier League season. Not many people could have expected Manchester United to beat the Gunners 8-2, but it happened, and Arsenal needs to bounce back and there won't be a better fixture for them to get them self back to winning ways. Also worth noting, the Gunners added five new players just before the transfer deadline, Mikel Arteta, Park Chu Young, Andre Santos and defender Per Mertesacker. Mertesacker will help the Gunners shore up the back line. Arsenal Captain Robin Van Persie, leads a host of Arsenal players, who are on rampage for their national team. Van Persie scored 4 goals for Holland, Park with 4 goals, Gervinho with 2 goals, Aaron Ramsey with 1 goal and picking up the Man of the match award against England. With this form, the Swan defence is in for the game of their life. SWANSEA CITY: The newcomers are a point better than Arsenal but still looking for their first goal in the Premier League after playing two goalless draws with Sunderland and Wigan. The coach stated that they will go in to this match pushing for their first victory and to add more woes to Arsenal's miserable start to the new campaign. If that will happen, remains to be seen. A draw in this match will mean a lot to the Swans, the team needs to up their game after failing to see the back of the net in 3matches. The biggest threat to Arsenal is Scott Sinclair, the 22-year old forward for Swansea, who was the leading scorer for the squad last year in the English Championship, recording 22 goals in 42 games. He is second on the team in shots this year, eight in three games, but has yet to record a goal. Swansea needs him to get on the scoring sheet, if they are to get anything from the Emirates. VERDICT: Both team looking for the first win in the League, unfortunately Swansea City will have to wait another day, Arsenal are up for this one. 3 points in the kit, it’s just a matter of how many goals the Gunners will score. How are you my Gooner Family? The weekend has finally begun to set in, which means that the wonderful and terrible thing that is football returns to the front of things. Our squad looks much stronger than it did just a few weeks ago, and from my vantage point, it’s like the season has started fresh. It’s going to be massive fixture, while Swansea presents no amazing level of skill pressure is still palpable. The main reason being the debacle at Old Trafford a few weekends back. One of the darkest days in the club’s long history, the bad taste left in everyone’s mouth will hopefully be washed away by the sweet taste of victory. In the marathon that is the Premier League season three points matters very much, and it’s important that the home form is approved upon from last year. From reports that have been circling this morning, Arteta, Benayoun and Per Mertesacker look to make their debuts and with J.Y. Park possibly making a late cameo appearance. The local hero Emmanuel Frimpong returns from suspension which all add the much needed physical edge to our midfield. From the few games of this still very new season, our midfield has lacked creativity but more importantly fluidity. Our Ramsey, Song, Frimpong, Rosicky and Arshavin cannot seem to form partnerships that allow for the passing game Arsenal requires of its players. Arteta and Benayoun will provide add technical quality as well as experience. Ramsey has a better motor than most midfielders, but he can get frustrated when he isn’t supplied with meaningful possession that he can use to supply goal-scoring chances. If Park does make his full debut I would wager that there could be a change in formation. Something like a 4-5-1 with Park at the head and RVP in the position of a truer #10. I don’t think that’s very likely though, and I trust Wenger to put the most competitive side on display tomorrow. As long as we play Arsenal football, we should walk out tomorrow with a win and break this season wide open. Count on big performances from RVP and Arteta, two of our more experience players who will help keep things together during the opening moments tomorrow. I think a quick opening goal will be just as vital as it was during the Udinese tie, the confidence that would come because of that would reassure players like Ramsey, Kos and Gibbs. I think we have yet to see the best from our young Welshman, who was tipped to fill the Fabregas role this year, and tomorrow could be a time to see what he is truly capable of. I expect the win. That’s all from me today, come on you gunners!